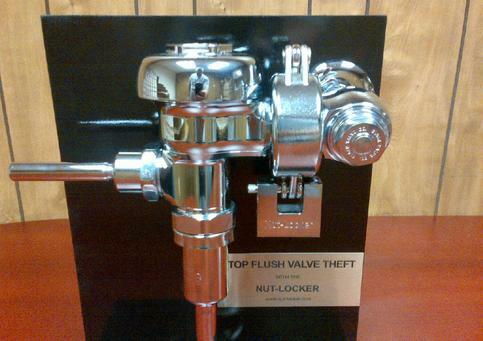 The Nut-Locker, is a device used to help prevent the theft of toilet & urinal flush valves. The Nut-Locker is made from Stainless steel ( Not Aluminium) ,the Nut-locker weights approx. 1-1/2 lbs each with the lock . A chrome plated hinge that creates a collar ,that when open is "C" in shape, but when closed secures around the flush valve nut and creates a barrier to help prevent the theft of the flush valve body by securing the nut inside the "Nut-Locker " enclosure.The Nut-Locker still allows access to the flush valve for maintenance and service. Toilet & urinal flush valves have recently become the newest and fastest growing target for theft due to the scrap brass value. These flush valves are expensive to replace. Protect yours today with the "Nut-Locker" .We offer many different key codes and you can get the Nut-locker keyed alike or differently .The "Nut-Locker fits most flush valves including Sloan, Zurn, Toto,Delany, Kohler ,even the expensive Automatic flush valves. The Nut-Locker is Safe-Flow's solution to the increase of flush valve thefts.It is designed with theft prevention as a priority.